Williams parents were John Wiseman HOWES and Sophia SMITH. John Wiseman HOWES was born about 1819 in Norfolk, England. His father was Robert HOWES, who was a mariner, and born about 1781 in Norfolk, England. 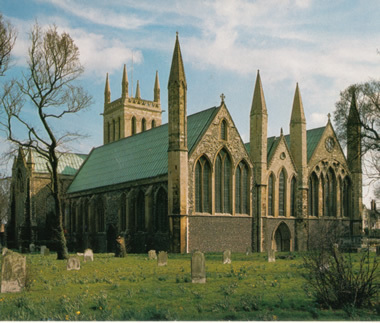 He married Sophia SMITH on 29 November 1842 at St Nicholas Church in Great Yarmouth in Norfolk. Sophia's father was Samuel SMITH, who was a Schoolmaster. Teaching would appear to run through the SMITH family as on the wedding certificate, Sophia's occupation was a Teacher of Music. Also, the wedding certificate stated that at the time of wedding, Sophia was a minor. It is geneally believed that he owned his own shipping company. His marriage certificate states that he was a mariner. And the 1851 and 1861 census for Great Yarmotuh, Norfolk, where the family resided, he is not listed, possibly at sea. The 1851 and 1861 Census does state that Sophia's is the head of the house and that her occupation is a Teacher of Music. However in 1849 when John's son, William was born, the family is listed as living in Millers Hill, Newcastle On Tyne, Northumberland and John's occupation is listed as being a a Policeman. Newcastle On Tyne Police Records do list a John HOWS (sic) that was a policeman in the area about 1847 and served for approximately one year before he was dismissed from the job. It also should be noted that the 1841 census for Great Yarmouth, Norfolk state that John, and his father, Robert were labourers. Sometime in the 1860's the family moved to London as that is where their son, William married in 1870. The 1871 census in London does list John as being a mariner, with most of the younger children still at home with him and sophia. However, by 1881, all but one of their children, Catherine, were no longer living at home. And in 1901, Catherine was still living with her parents. Sophia died in Hackney, London on 1 July 1903, and was living in Clapton Park, London at the time.about Sep 1903. John died in Hackney on 20 July 1909, and he had also been living in Clapton Park. Sophie Sewell HOWES was born in 1845 in Great Yarmouth, Norfolk. Esther HOWES was born about 1846 in Great Yarmouth, Norfolk. William HOWES was born on 11 February 1849 in Newcastle On Tyne, Northumberland and died on 19 March 1932. He married Caroline TURNER on 25 September 1870 at St Giles, Cripplegate, London. They had thirteen children. Elizabeth HOWES was born about 1852. Caroline Ellen HOWES was married to Herbert John NEWMAN. They had seven children, Bert, Frank, Alice, Fred, Ron, Bernard and Rita. Jim HOWES. It is known that he died during the First World War. Although Elizabeth's younger sister, Catherine remained at home with her parents upto at least 1901, by 1903 it became apparent that both John and Sophia had moved in with Elizabeth and required some looking after as they had both died from senile decay.